In the summer of 2016, Chris Duncan was part of the first-ever cohort of students in San Diego State University’s newly launched Craft Beer Education Camp — a distilled, nine-day version of the popular Professional Certificate in the Business of Craft Beer program. His purpose was to learn what he needed to fulfill his dream of opening a tasting room, and he wasted no time. 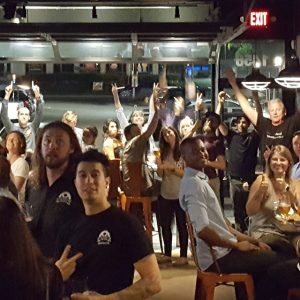 In July of this year, The Brewers Tap Room opened in Encinitas Village Square, and it’s already a hit. “We’ve really become a local ‘pub’ with folks loving the constantly rotating handles and just being a place where they can come and usually see someone they know,” said Duncan. The Brewers Tap Room has the feel of a brewery tasting room but they don’t brew beer. Instead, Duncan chose to “honor the brewers that do.” He personally curates from local, independant nano breweries, offering tasters, flights, and full pours of beers you typically wouldn’t find anywhere but in their own tasting rooms. Duncan and his staff are all Certified Cicerones ®, thus the perfect guides through the 25 ever-changing offerings. They’re experts in beer styles, flavors, ingredients, the brewing process, and even beer and food pairing. The Brewers Tap Room doesn’t serve food, but guests are welcome to bring food from the nearby restaurants. Duncan answered a few questions about the journey toward his tap room dream. What does your curation research look like? I spent the six months before we opened visiting breweries, tasting, and taking notes. That gave me a nice “book” of brews to refer to when we first opened. Now it’s nice because the breweries come to me for the most part with growlers and bottles or cans of things for me to try. I still try to get out to breweries as well since it is great to meet the brewer or owner and hear more about their story. How long has your dream of a tap room been in the making? I can actually trace it back to a trip to Europe after high school in 1985. I loved the beer gardens in Germany and wondered why we had nothing like that here. Fast forward over 30 years and after 23 years in corporate America, I simply decided it was time to pursue a passion. I brewed for a short period but it didn’t compare to all the great stuff being made around me so I decided to enjoy the beer, not make it. When did you go for your Cicerone test and how well did the program prepare you? I took the CBS test shortly after the class, which really prepared me for it. It did require some further studying because of the very specific questions, but the class and industry instructors were key elements of my knowledge. Can you cite a few moments along the way to opening your tap room where things you learned at SDSU Craft Beer Camp were instrumental? Many moments. From Front of the House insights taught by Dave Adams, to learning how we enjoy and interpret beer by Dr. Bill [Sysak], all played very important roles in building my business. When did you first discover your love of beer? My love of GOOD beer happened on that trip to Europe. In addition to the beer gardens, all the much more flavorful and interesting beer in Europe really made an impact on me. I think we can all agree that much or our current craft beer movement is rooted in European beer whether it be New Belgium and their Fat Tire beer origination or simply the realization that the watered down, mass produced beer we accepted for so long was no longer good enough and we sought out making better beer like they’ve done in Europe for so long. I personally love Belgian beers. What did it feel like to say goodbye to your day job and fully embrace your dream? Like many others who finally make the leap into entrepreneurship, I was laid off from my last “job” and I then went into consulting in my field (pharmaceutical/biotech commercial development and marketing). Consulting gave me the time and schedule to be able to pursue this dream while still working. I’ve been very fortunate to be able to maintain both my consulting and running the tap room. I have great servers working for me and, as I get them more engaged in the business, I plan to start looking for other locations to open additional tap rooms in Southern California. The concept of serving only independent, local craft beer in a tasting room setting where people can bring in their own food and just hang out with friends over great beer is something I believe will resonate in other neighborhoods. Somewhere between now and then, I will fully depart from my consulting and enjoy the spoils of a full life in craft beer. While we may become a destination for some who really want to seek out a great collection of local, unique beers in one location, The Brewers Tap Room has been embraced by our local community in such an unbelievable way. I would have never imagined it would be a place where my beertenders and I would get to know so many of our local neighbors and have so much of their support. Aside from being total beer geeks, they are great people who have made this place about as close to a “Cheers” as I could have ever imagined. 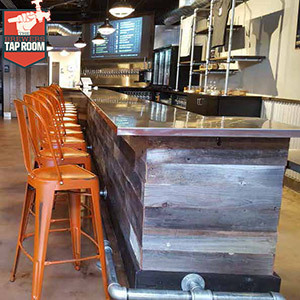 The Brewers Tap Room is at 456 Encinitas Blvd., open Monday–Thursday, 4–9 pm; Friday and Saturday, noon to 10 pm; and Sunday, noon to 9 pm. Read the story covered by the Encinitas Advocate. Read the blog story on Chris Duncan’s SDSU Craft Beer Education Camp experience.